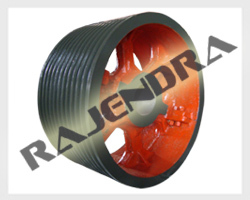 Rajendra Pulley is continuously engaging in manufacturer and supplier and exporter of V belt pulley with taper bush are available in various sizes as specified by our clients. These V - Belt Pulley have many applications in transmission system in various industries. These V belt pulley is equipped with taper bushes that further make the motion more easier by reducing the friction level.We are offering different kinds of V-belt pulley which are highly demanded by our client's specif actions. We are offering the belt pulley at nominal price. At Rajendra pulley Good design these pulleys according to the specification of the client. V-Belt pulleys are made through effective cast iron and cast steel. The Pulleys that we provide are highly appreciated by our clients. Moreover the pulleys that we provide consume less maintenance, whereas they are easy to use.